Today is Fathers Day in the United States. I am proud to be the father of four wonderful young ladies. It feels good to be the dad. There’s a lot of responsibility that goes with being the dad, but there’s a whole dimension to life that I would miss, were it not for my daughters.I share something different with each of them and so we all connect on different levels. The cool thing is that we all connect, and that makes life sweet for me. We have been through good times and bad, and I am sure that there are good times and hard times to come. I aim to make the best of all of them. To squeeze every drop of goodness each moment has to offer. My girls have taken me to the hard fundamental “why” questions that I never gave myself permission to ask. When I was a child, I didn’t ask those kind of questions because I needed to be accepted, to fit in. Whatever it took to “fit in the box”. When I became an adult, I stayed in my comfort zone; busy with learning how to make a living, and I still didn’t ask “those questions”. It was enough to assimilate to the group’s beliefs. One by one, my ladies entered teenagerhood and pushed back hard on my box of beliefs. They were asking me the hard questions like: What do we believe? Why do we believe that? How do we know we are right? How can a loving God…? Oh boy! I was suddenly faced with the questions that I had ignored and pushed down deep inside me, except it wasn’t just about me anymore. It was the ones I love more than life itself. My love was bigger than my discomfort and I started searching for answers for them… encouraging them to ask the questions… and allowing my long-held beliefs to be put to the test. Some of my beliefs have come through unscathed, some have been discarded as somewhat less than true, others as lies. The jury is still out on the lion’s share of them. For every answer I get, there are usually three or more new questions that come with it… but I keep asking. And the asking is rich even when I don’t get the answers. It’s ok to be honest about that. No one knows you like family. And it is not a given that you will be loved in spite of yourself… and yet that is where I find myself; loved in spite of my shortcomings. Thank you for pushing me. Thank you for loving me in spite of me. Thank you for hugging me and telling me that I am a good dad. I need that. (That feels very vulnerable to write. Will I have the courage to post it on the web?). Thank you for showing me that I don’t have to have all the answers in order to be a good dad. I am a blessed and thankful man today because I am so proud to be your dad. Happy Fathers Day to me! I was looking at a photo of my paternal grandparents this morning and wondering who they really were. Oh, I knew them (My grandmother just died last hear), but I didn’t really know them. I don’t think they even knew themselves. I am full of feelings; joys, fears, doubts, questions. Sometimes I feel like I’m right where God wants me to be and doing just what he has for me… other times, I am paralyzed with fear for no apparent reason. After going through the Great Depression, I am sure that having shelter and enough food was a driving fear. Frugal would be a great understatement. What else was there? Did they talk about their feelings to one another? They showed me that they had it all together. Being a child, I believed that. I believed that one day, I too would have it all together. I would know who I am, what I believe and where I am going. I don’t have it together and don’t believe they did either. They reduced life to a few simple rules. Follow those rules and you get a get-out-of-hell-free card at the end of your life. I think there is more to life than that. More to following God than that. Do I sound disrespectful? I don’t mean to. They were who they were. Now that sounds like a copout. I don’t mean it to. I guess I am resigned to the fact that I will never know what happened to them. What were their joys, their sorrows, their hurts and fears? What made them feel on top of the world? It would help me to know who I am. There’s something comforting in the thought that I’m not the first one to feel the things I feel, to struggle with the tendencies I struggle with, to fear the things I fear and to wrestle with the questions I do. I am a mess. I do not have all the answers and it seems like every time I wrestle with a big question and get an answer, it comes bundled with more questions I hadn’t even considered before. I am afraid. I fear failure. I fear success (does that sound weird?). I want more than anything to follow God… not some impersonal god idea… I want to follow the God of the Bible. First and foremost I want to be identified as a follower of Christ, but I don’t like the baggage that comes with that label. I am a mess. But Jesus loves me anyway. That is the good news. Although I cannot earn his love, I want to serve him because I do love him. I want to love in a revolutionary, radical way. I want you to come along. Let’s explore this life together and help one another. I love you. That’s true love. I am so proud of my family! Sometimes, I see something that I just have to stand back and applaud. 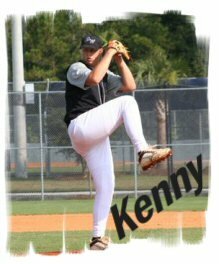 My nephew, Kenny (who got absolutely none of his athletic ability from me) is the pitcher for his school’s baseball team. I cannot begin to tell you how incredibly gifted he is at what he does… (but that says less about his ability and more about my ineptness as a baseball fan). I think his pitches have been clocked at about a Brazillian miles per hour. No wait, a Brazillian is someone from Brazil. Anyway, he’s fast. Like most ball players, he sometimes hurts himself and it takes him out of the game for a time of healing. He’s lately been out nursing an elbow injury, but this past Saturday, they finally let him play two innings. He gave up no hits and struck out five batters! On top of that, he had a 100% on base percentage with two singles. To top it all off, he also hit a home run (about 350 ft)! Needless to say, everyone in the family, including me, is busting buttons with pride. However, that’s not why I am writing about him. I’m writing to tell you what most of the folks in or out of the game don’t know… inside Kenny’s hat is a Bible verse. He wrote, “I can do all things through Christ who strengthens me” Phil 4:13. When he stepped up to the mound, he took off his hat and read the verse to himself, said a prayer. Then he went to work applying his talent, and setting out to demonstrate the power of those words. Is this passage in Philippians about winning ball games? I think not. It is about depending on the strength of God to help us in everything we do. In the game of life, I need God’s help, but sometimes I forget. I proceed with delusions that I can manage just fine on my own. He frequently reminds me that I cannot. Frequently He uses others to show me… sometimes it’s a friend… sometimes family… This time it’s my nephew. Thanks Kenny, for reminding me what a great God we serve. I’m proud of you.